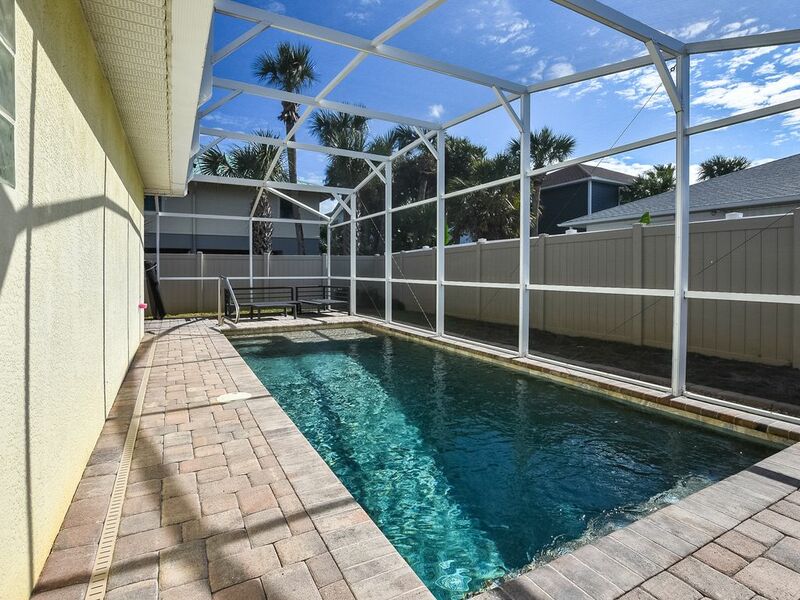 Beautiful salt water pool w/solar heat! You'll love the privacy our Lighthouse offers. This house is just a two-minute walk to the beach with no busy roads to cross. It's fully furnished - all you need to pack is your bathing suit and toothbrush! It has hairdryers, iron, ironing board, beach chairs, beach umbrella, boogie boards, and beach toys. Wireless internet access too. It's beautifully decorated and kept spotlessly clean. There is a TV in the living room, and all the bedrooms. The master bedroom has a walk-in closet and a sliding door leading to the patio in the private screened-in lanai and back yard. New Smyrna Beach has many good restaurants, shopping, art galleries, miniature golf, parks, fishing, golfing, and of course, the greatest beach around. There is a park two blocks away where you can play tennis and basketball. The house is within walking distance to the shops on Flagler Ave.
You can go to the attractions in Orlando during the day and come back to New Smyrna Beach to relax at the beach. Our central location makes getting around a no-hassle experience. You'll love staying in a private home instead of a condo - no elevator waits, long hallways, noisy neighbors, and parking in a lot or garage. You can drive into the garage and be two steps from your own private get-away. You'll enjoy the privacy of your own house, the quiet, and never want to leave! No limit long distance (US) and local calling. Parking in garage, driveway and street. Seating for 4 at bar also. Seating for 4 on patio. 50" in living room, 40" in 2 of the bedrooms. Vast collection of board games and children's videos. Large front yard, fenced in back yard. Covered Patio and private back yard in tropical setting. New inground pool - screen enclosure, solar heated, salt system. Beach chairs, umbrellas, boogie boards and toys all furnished for your enjoyment. House was very nice and clean and everything on the website was correct. The house also comes with tons of beach equipment and other cooking tools and everything you need to have a great stay. Only problem I had is that as the guest, you are unable to change the pool temperature. While a very nice pool, the pool was too cold once the sun went down. While in the summer this might not be a problem, the mild temperatures made it intolerable outside of when the sun was up. Other than that, everything exceeded expectations. We had an awesome stay here with our family and pup. Everything is within walking distance, including the beach, grocery store and Flagler Ave. shops and restaurants. Thank you! Beautiful, spacious home. Perfect location with short walk to the beach or Flagler Ave. This house is very spacious and comfortable. We enjoyed having the pool to use after a hot day on the beach, which was a short walk across the street. Flagler Ave was also a short walk and there are plenty of wonderful restaurants right near the house. Publix was right there as well. We hope to come back again! Thia house was amazing. Plenty of space. And the pool was great. Will definitely rent again. We had an amazing time at nsb. And this house was wonderful. Only a short walk to the beach. And the pool was perfect. The house was very clean and had lots of space. Comfortable for all 8 of us. Spacious, charming, and convenient location! Great for families with pets and all the amenities you could wish for. Convenient to everything NSB has to offer. Very comfortable and accommodating home. Easy check-in. Super friendly owner.